Chimera Lighting will introduce a frameless Lightbank and a Lantern for the Litepanels Gemini at the upcoming NAB Expo in Las Vegas. The Lightbank is lightweight, collapsible and handmade in Colorado to Chimera’s high quality standards. The Lightbank uses Chimera standard small size front screens and increases the aperture of the Litepanels Gemini to 24” x 32” (607 mm x 83 mm). The Lightbank (p/n 1629L) will be sold as a kit, with grid-less front screens in Full and Half, packed in a messenger style kit bag, all weighing less than 2 lbs (0.9 kg). The Chimera Lantern for Litepanels Gemini kit (p/n 1842) uses a frame to mount in the fixture accessory holder and expands to 28”x 35” x 22-1/2” tall (711mm x 889mm x 572mm). The kit includes 27-1/2” (698 mm) skirts, which can be rolled up and down to control spill. The kit packs into a zippered duffel. The Chimera Lightbank and Lantern for Litepanels Gemini will be shipping on or before 1 May 2018. These products will be available from Litepanels distributors and the global Chimera dealer network. Visit Chimera at the upcoming NAB in booth C4749 for a look at this and other new products. 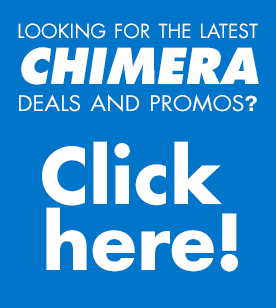 For additional information on CHIMERA’s Lighting Products and to find your nearest dealer, visit www.chimeralighting.com/dealer-finder. Litepanels is a market leader in LED lighting systems for the television, broadcast, video and film industries. Their ground-breaking, award-winning lighting products are developed with a clear focus on performance, reliability and efficiency to deliver the very best results for all their customers. CHIMERA has been providing high quality light modifing products to the motion picture, video and still photography community worldwide since 1980. Chimera products are lightweight and portable and can turn your hard light into a beautiful broad, diffused light source within minutes. Chimera products include Lightbanks, Strip Banks, Mini and Maxi Banks, OctaPlus Banks, Panels and Frames, Lanterns, and Speed Rings.